You get impressive volume output with very low and negligible distortion. They are moderately priced so that it would not burn a hole in your pocket. You can disassemble it easily. Though the price is not very high, you can still get better headphones at the same range. Also, you do not have many customization options. With the help of ATH a700 headphone, you can enjoy enhanced sound clarity. The 1/4 inch adapter that comes in handy with the device is compatible with all possible stereo systems. The Audio Technica a700 also known as Audio Technica ATH a700 headphone has a long cord and big ear cups. The band consists of two plastic rods along with two pads. When you use the microphone, the only thing that rests on the top of your head is the pads which are connected to the cups with the help of springs. That means as soon as you place the headphones on your head, they make themselves comfortable accordingly. As far as accessories are concerned, you only get a 1/4 inch adapter with the ATH a700 headphone that is gold plated. The closed back design of the microphone boasts of a double air damping system that is concerned with promoting deep bass. This also implies that you get fully enclosed earpieces and not vented ones. The best thing about the ATH a700 headphone is that the bass is full-bodied but not overblown. The highs as well as the mids are sufficiently smooth, clear and expressive. Another thing that makes this headphone stand out is that it can do even without a very powerful headphone amplifier. Along with providing a comfortable sound, the ATH a700 headphone also ensures superior physical comfort so that you do not mind listening to your phone and jiving to the latest beats for a long period of time. However, the size of the ATH a700 headphone can pose as a deterrent for some. It is slightly bulkier than the average size which can make portability an issue. 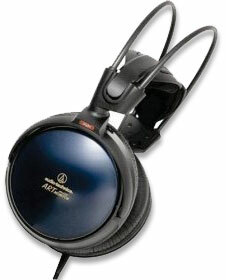 All in all, the ATH a700 headphone is not a bad choice to make as you would certainly get your money’s worth.